Stamps from The Alley Way Stamps make me giggle especially Chick Magnet that I used to create today's card along with the sentiment from Birds of a Feather! 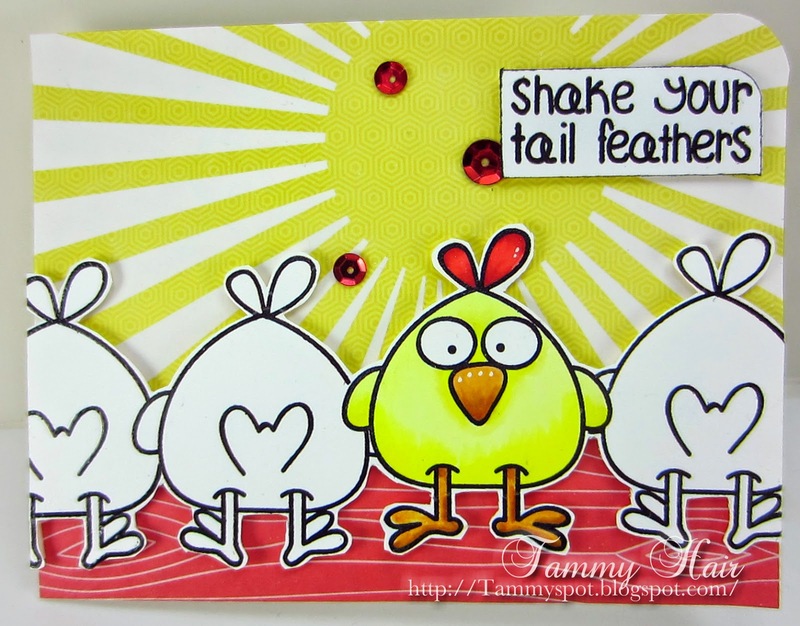 Can you imagine a flock of chickens doing a line dance while out on the town? Me neither but it does make me laugh thinking about it! Thank you for making me smile with your fun card Tammy! I love the image and wonderful design. I'm smiling from ear to ear too Tammy..what a great fun card. Such a fun card. Bit too cold to be out shaking tail feathers though...brrrr. Okay - I just LOVE this - I am sooo in love with "anything" chicken! Great design and super cute! Oh wow this is adorable Tammy!! LOL!! Love how you've stamped the row but spotlighted the one! ;) DARLING!! Line dancing chickens!!!!!!! I can't think of anything more fun and I'd probably have to join them too! CUTE, CUTE card!!!!! Love all those little guys lined up like that! This is just too fun! Love those line dancing chicks. Of course I'd be the one lot of line and would rather be drinking a frosty cold one instead :-). Hahahaha! I immediately thought this would make a cute refrigerator magnet. So cute! This is so cute and made me giggle right away!